We are traveling over land and sea by public transit to Puerto Montt, Chile. One purpose of our travels is to investigate cycling culture, transit, and public spaces in Latin America. These travels have taken us through Guadalajara, which is an official Sister City to Portland. What we found in Guadalajara were many innovations in cycling culture that can inspire Portland. Below, I’ve summarized the key takeaways from three pillars of Guadalajara’s transportation revolution. 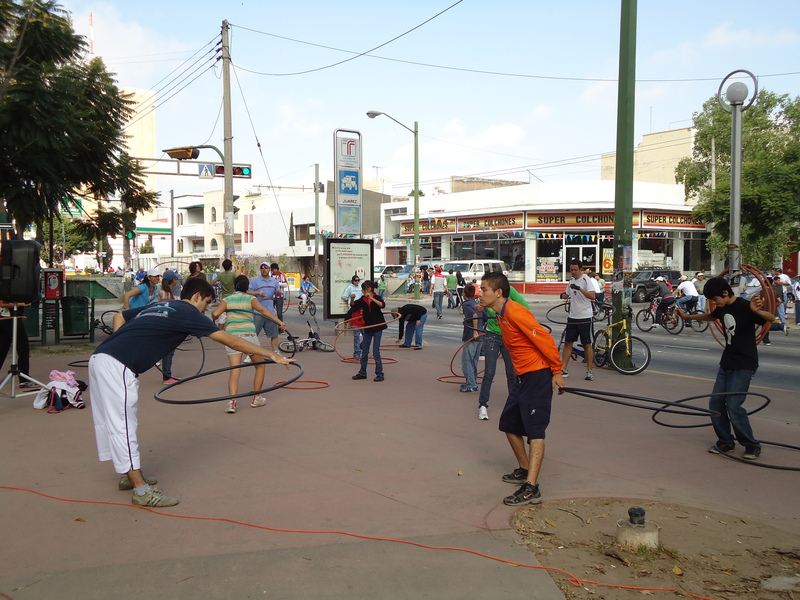 Via Recreativa was originated by citizens devoted to building more public spaces in Guadalajara. They pushed the city to start experimenting with the weekly event. Event is not just for cyclists. There are many pedestrians, disabled, rollerbladers, & skateboarders. The city conducts outreach to these different groups. This car free Sunday event occurs weekly since 2004. Now attracts an average of 150,000 people and stretches 25km in Guadalajara alone. Local schools and universities require volunteerism as part of curriculum. Via Recreativa is one of the most popular options. Route showcases local public spaces and new plazas. The route is also used to experiment with creating new public spaces. For example, Av. Chapultepec now has a widely used pedestrian plaza in the median, where it used to be a neglected planter strip of trash and dying plants. Businesses use the Via Recreativa as a marketing opportunity. The local newspaper has 2000 free loaner bikes for the event. 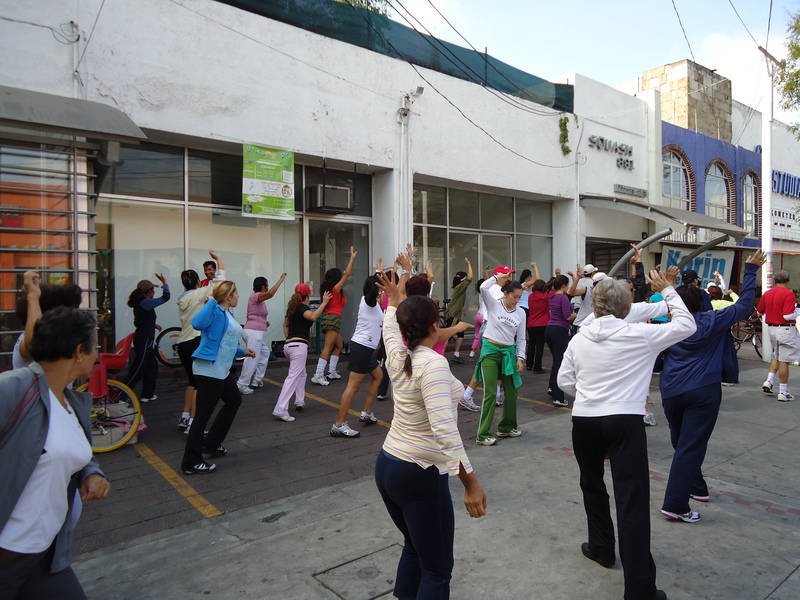 Fitness clubs lead dance classes in their parking lots. 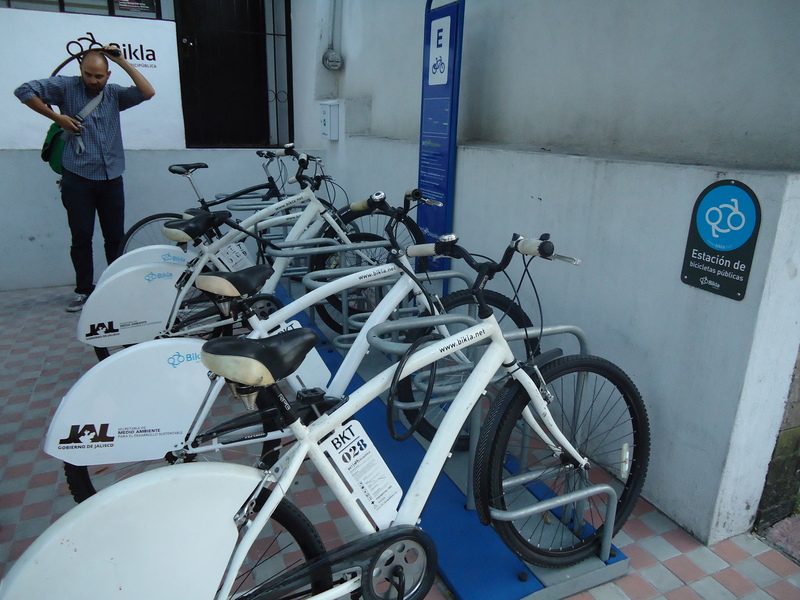 LaLa Milk company offers free bikes for city tours of the route. Restaurants and bars advertise Sunday specials to Via Recreativa participants and overflow with customers. Learn more about what we learned from the Via Recreativa here. We attended two “bike fun” rides in Guadalajara put on by the group “Al Teatro en Bici.” We were very impressed by the hundreds and thousands of cyclists of all ages that they have participate. Ride organizers actively pursue collaborations with non-profits (Red Cross), businesses (local newspaper), and the City of Guadalajara. These sponsorship help with promotions and marketing of events and cycling and also increases non-cyclist turnout. The activists are not just devoted to cycling advocacy or ‘bike fun,’ but to use cycling as a vehicle for “a social movement for urban mobility, culture, and public spaces.” We heard this refrain repeatedly. Rides are not political, but intended to transcend party politics and be a broad social movement. Over four different rides a week by three separate groups. Al Teatro collects nominal dues of $6, that allows a member access to their bike share library. Group rides are very inclusive. All partying occurs at the end of the ride. Very diverse participants, from elementary students to the elderly. 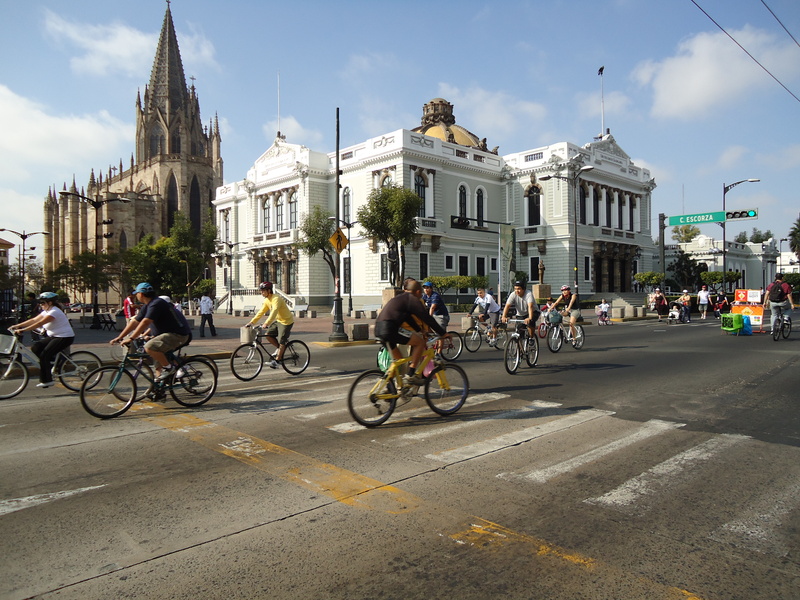 We shared many more details on our “Bike Fun in Guadalajara” posthere. 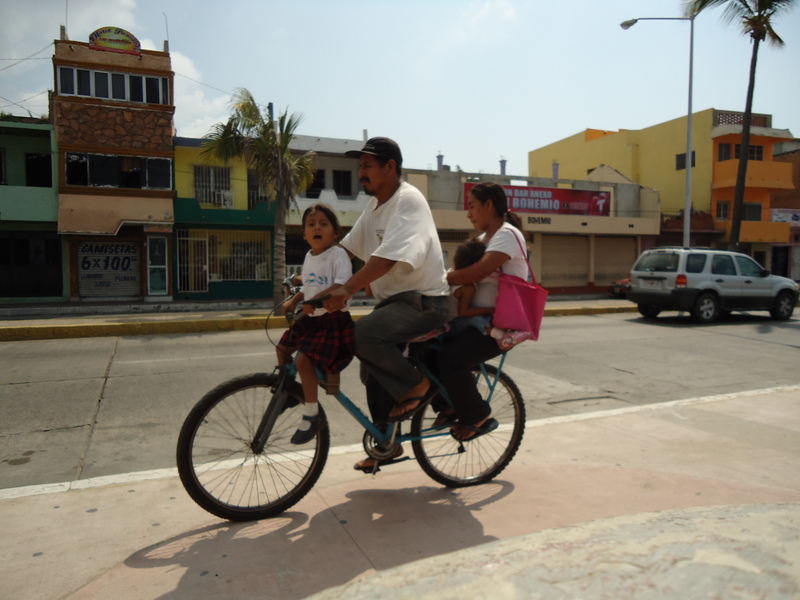 Guadalajara, like many other cities, wanted to develop a bike share system. Initially, the city government did not have the political will to implement a plan. Citizen activists took the lead and designed a very affordable, innovative approach to bike sharing. They did not rely on government subsidies or advertising revenue to fund the program. Theyrelied on the sales of bike racks! Since their initial success they now have 2,600 members and both the City of Guadalajara and the local newspaper have started their own Bike Share systems. Read our in-depth report on the citizen initiated Bikla Bike Share program here. Guadalajara has many lessons to teach us. In Portland, we often look to New York and Copenhagen for inspiration, while our sister is pushing the boundaries and creating many innovations that we could learn from. Her citizens are passionately pushing for a new urban mobility, culture, and public spaces. Her leaders are following. If you want to learn more about our transportation investigations in Guadalajara, check out our photos and stay tuned to the Active Right of Way blog for more reports. We’re also tweeting as we go via@portlandpedals. Via Recreativa in front of the University of Guadalajara ©Ryan H.
Guadalajara is a city devoted to public spaces, parks, and plazas. Any given day or night these spaces are filled with families, vendors, and musicians. It is little surprise then, that Guadalajara hosts one of the most successful Car Free Sunday events the world over. This event, called Via Recreactiva, was inspired in a similar fashion as many other innovations in Guadalajara, by citizen activists. We tracked down the Director of Via Recreactiva in Guadalajara, Oscar Rodriguez Aleman. He told us the origins and history of how Guadalajara had created this weekly space for community and health. The citizen activists of Guadalajara were studying how to compose better public spaces and urban vitality. They met with the former mayor of Bogota, Enrique Peñalosa and were inspired by the example of this city in Colombia. Since 1976, Bogota has opened streets to cars by removing vehicular traffic, every Sunday. Approximately 2 million inhabitants of Bogota regularly enjoy these car free spaces to play, recreate, exercise, and socialize. The citizen activists of Guadalajara teamed up with municipal “bureaucractivists” to try out the idea of a weekly car free space. This idea had not been successfully employed in Mexico before. Some of the government officials were very excited to put a car free plan into action, reacting that “let’s start tomorrow!” Instead, the city studied the idea for 6 months before hosting Guadalajara’s first Via Recreactiva on September 12, 2004. Hula Hooping in the Park at ViaRecreActiva ©Ryan H.
Quickly, the experiment proved to be a great success. The only drawback was that too many people were attending, so Guadalajara had to rapidly expand the route! In 2008 and 2009 the surrounding suburbs started their own Via Recreativa events. These car free spaces occurred because of citizen demand. Now the Guadalajara route connects to these neighboring suburbs of Tonala, Zapopan, & Tlaquepaque. Together these Via Recreativs compose an extensive route stretching throughout the metropolitan region from the center of the city to residential suburbs. Another distant sprawling suburb, Tlajmulco, also has a weekly Via Recreativa in an area of the Guadalajara metropolitan region that resembles much of suburban United States, with big box stores like Home Depot and Walmart dominating the horizon. 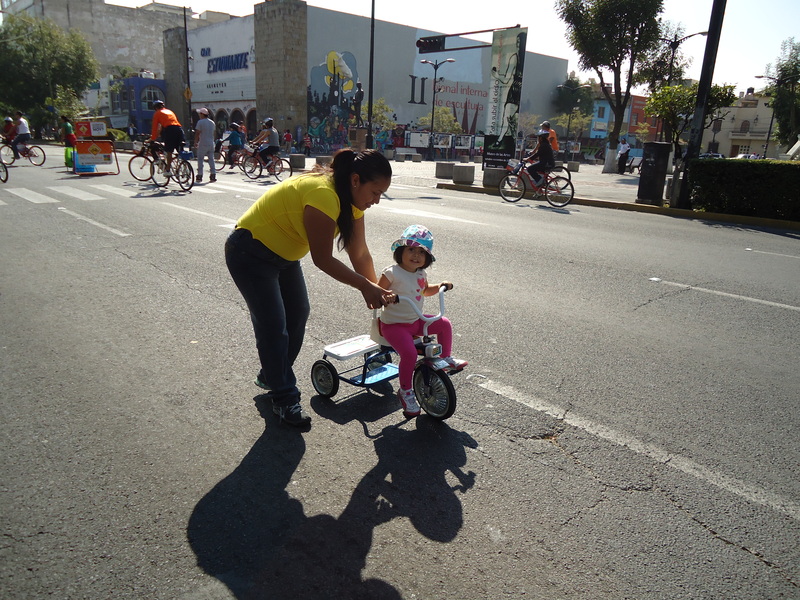 Little Nina learning to ride her trike during Via Recreativa, on what is ususally one of the busiest streets in the city. ©Ryan H.
Having experienced the summertime monthly car free “Sunday Parkways” in Portland, Oregon, we were delighted to see a larger and more mature event. The first thing that I noticed was that the streets were not just filled with bicyclists, but also with walkers, rollerbladers, youthful skateboarders, and the disabled. Children were learning to ride their first tricycles and bikes on the route. Teenagers and young adults giggled, while learning to rollerblade. Longboard skateboards carved these downtown streets. A Fitness Club leads dances n their parking lot during the Via Recreativa ©Ryan H.
As the route progressed through downtown, engaging events were on every block. Volunteers were teaching hula hooping in the park and others were playing “Twister” on the sidewalk. Businesses spilled into their parking areas and led dance classes or held sidewalk sales. Mobile bike mechanics pedaled the route. 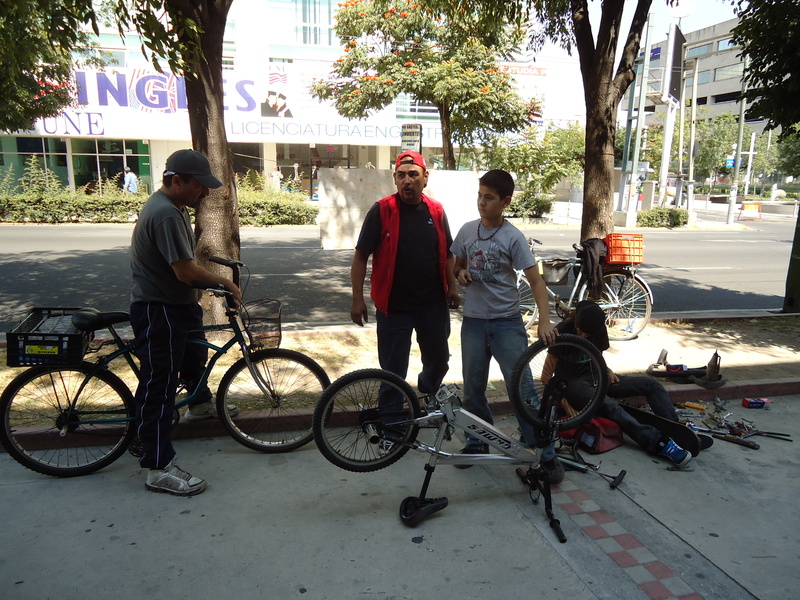 The city invited bike store owners and mechanics to set up shop on the sidewalk, repairing and offering advice on how to best tune up one’s bike or skateboard, earning tips in the process. The local newspaper, El Informador offered over 2000 free bikes emblazoned with their logo to anyone who brought a coupon from the morning paper. Tours were led often of Guadalajara’s many historic sites along the route by city staff and volunteers. Free bikes with ‘LaLa Milk’ advertising were available for these tours. Restaurants offered breakfast and brunch specials and bars advertised drink deals. A bridal shop on the route, unlike most others in town, was open on a Sunday and had a huge sign proclaiming that fact, “ABIERTO DOMINGOS.” A children’s scooter race course was set up in a new plaza in the middle of Avenida Chapultepec. Underneath the Gates of Minerva, skateboarders jumped and pulled tricks. Every where we looked families, youngsters, disabled, and the elderly were enjoying this people friendly space running through the center of the city. Father & Son Bike Mechanics help fix bikes & skates at ViaRecreActiva ©Ryan H.
We were only able to explore a fraction of the route that now stretches from Tonala to Tlaquepaque, then into Guadalajara, and off to Zapopan. The incredible length of this combined route allows all inhabitants of the Guadalajara metropolitan region a chance to recreate in their neighborhood and beyond. 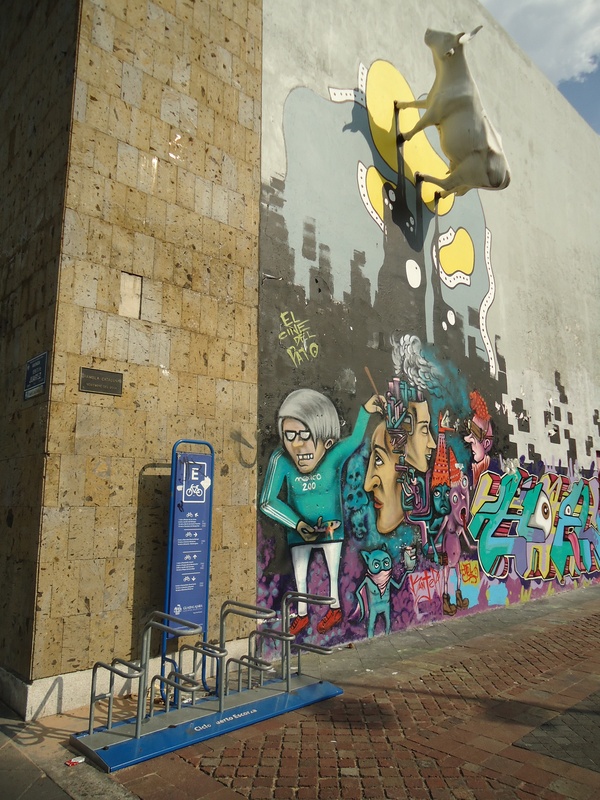 We only experienced a small part of this delightful Via Recreativa, but were amazed at the approachability and humanity of Mexico’s 2nd largest city. This people friendly space welcomed us to beautiful Guadalajara, a city shaped by the visions and dreams of her citizens. Al Teatro en Bici's fleet of bikes to loan with their stereo trike in front. ©Ryan H.
An homage to a departed bike clown. (On a mini bike!) ©Ryan H.
The Tuesday we attended Al Teatro en Bici, it was a tribute to a recently deceased member of the cycling activist community, Chino Cappuccino, a bike clown. Many of the participants and organizers wore clown noses in tribute. Instead of the usual destination of an outdoor plaza or theater, this night had a very different destination. The 5km route was a circuitous loop that climaxed at the funeral home where all the pedalers applauded respectfully for their deceased friend and his mourning family. This ride was also special because the city had just removed 15 automobile parking spaces and replaced them with Guadalara’s first on street bike parking. The bike parking to be used for 200 free bikes provided by the local newspaper, El Informador, as a bike sharing program administered by Al Teatro en Bici. 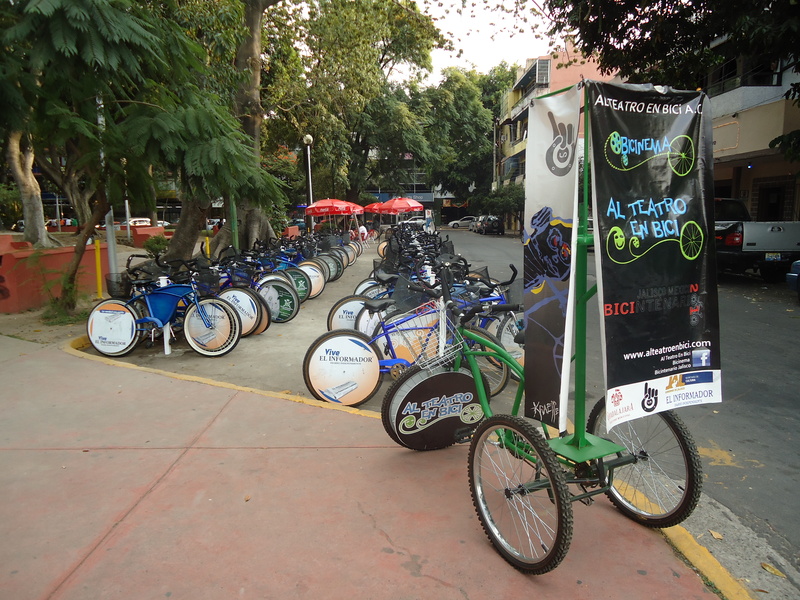 These 200 free bikes are available to Teatro en Bici members. These bikes are single speed cruisers with Informador advertising and are available in exchange for a photo ID to anyone who has paid their $6 USD annual Al Teatro en Bici dues. This arrangement composes one of Guadalajara’s three different bike share systems. These loaner bikes also allow for many non bikers to join the ride. The Tuesday evening ride had over 700 participants and all of the 200 bikes were being used. These loaner bikes dramatically increased the diversity and demographics of the participants. These bikes were being used by young kids, the elderly, and many others wobbling down the streets. The loaner bikes and the huge group ride created an opportunity for inexperienced cyclists to enjoy the bustling city safely. The local Red Cross sponsors the ride ©Ryan H.
Another way that Al Teatro en Bici encourages diversity of cyclist skill levels is by having at least one mobile mechanic on bicycle accompanying each ride and a Red Cross pace car – truck on each of the rides. My first reaction to the bright red truck with flashing yellow lights was disgust at a truck tagging along, because we are on a BIKE ride. Though, as the ride progressed I saw that the young kids or the elderly who got tired would have their bikes put in the back of the truck and get a ride back to the park. 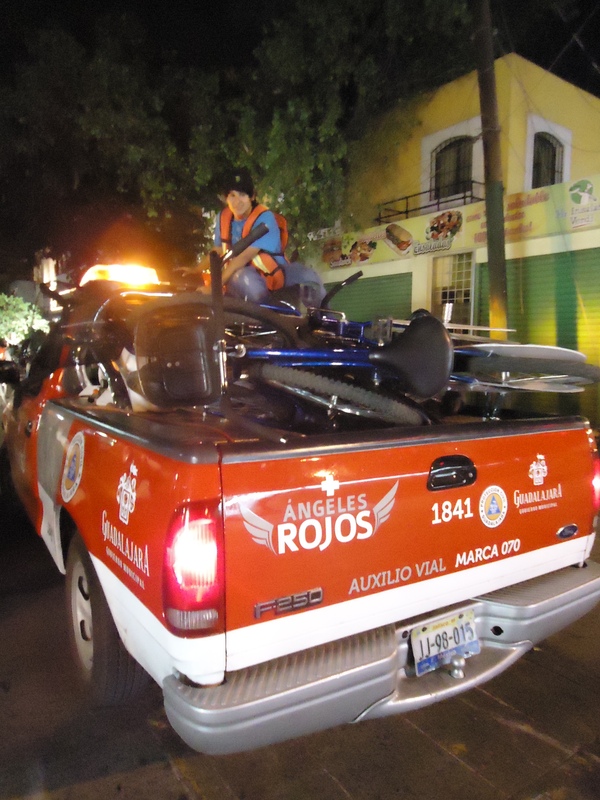 This truck provided medical support and picked up broken bikes. The truck also helped mitigate confrontation with aggressive drivers and allowed a sense of authority to the bike ride. None of the other ride participants shared my concerns of having a car with us, so I got off my figurative tall bike. The crowd thinned quickly, being a Tuesday night, and only 150 or so people stayed to enjoy the concert and party. I took the opportunity to pepper the organizers and attendees with questions about the history and purpose of Al Teatro en Bici. Everyone was very excited to share their experiences with this Gringo from Portand. They all told me how their cycling activism was not political in any way, that it was purely a “social movement for urban mobility, culture, and public spaces.” Everyone I talked to told me that this was their common purpose. It seemed so much more mature than bike rides that I have participated in elsewhere. They refused to identify with the left or right politically as a movement. 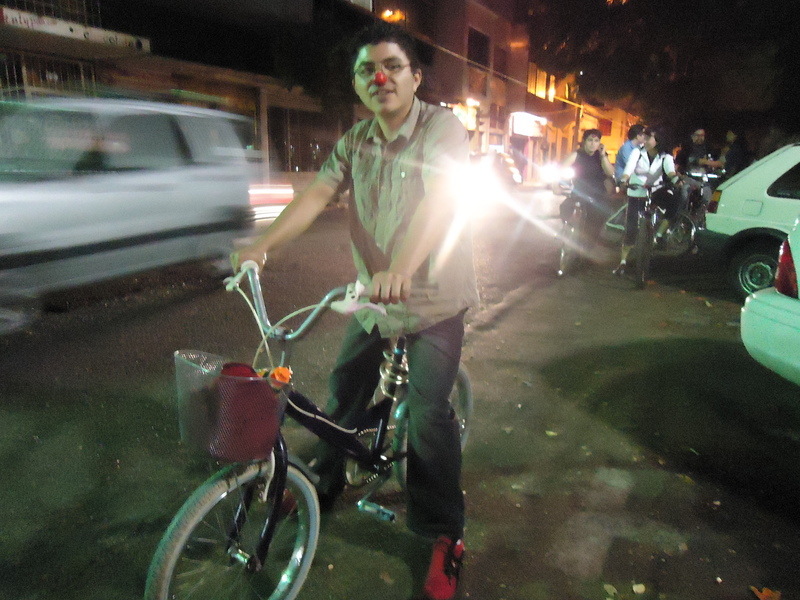 For these activists, the Al Teatro en Bici was an opportunity to re-envision mobility and promote culture in Guadalajara. Ride organizers keeping everyone safe. ©Ryan H.
A diverse group departs after our "Bicinema" ©Ryan H.
Al Teatro en Bici activism is continuing to innovate, by bringing their rides out into the rural areas of the state of Jalisco by launching a new set of rides. These rides, called Bicientenario, are a play on words in honor of Mexico’s 200th birthday. 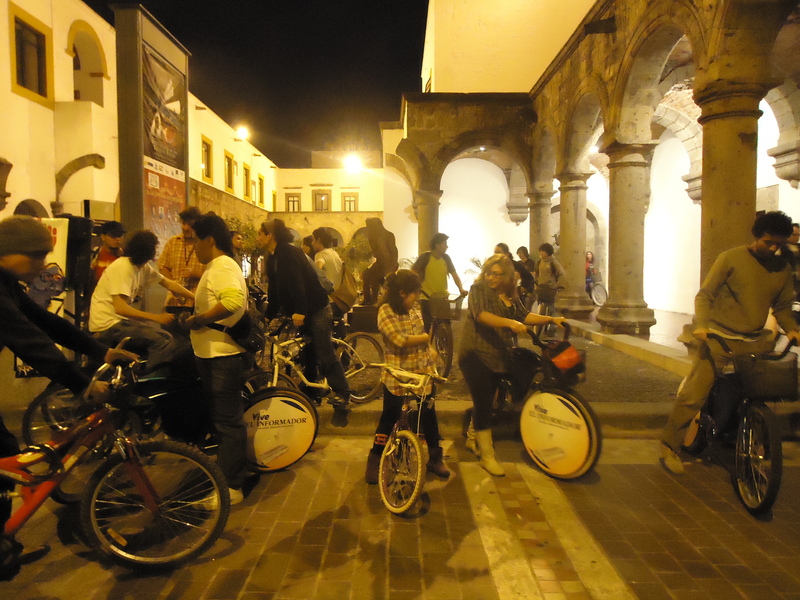 These monthly rides are arranged to bring culture and cycling to the rural areas surrounding Guadalajara., using a truck and a bus to take participants out to a rural village, where they lead a ride throughout the town and then settle in to watch theatre or projected films. This story was written by Ryan Hashagen & translated and edited by Lale Santelices. This Ciclo Puerto was built by Bicipublica and is designed for 6 bikes to fit in the space of one car parking spot. ©Ryan H.
When cycling activists in Guadalajara, Mexico were frustrated with the lack of bike parking in their city, they decided to build it themselves! A group of Cycling activists in Guadalajara, Mexico called Bicipublica have taken an innovative approach to the lack of cycling infrastructure in their city. These cyclists decided to start an enterprise building bike racks and selling them to local businesses. 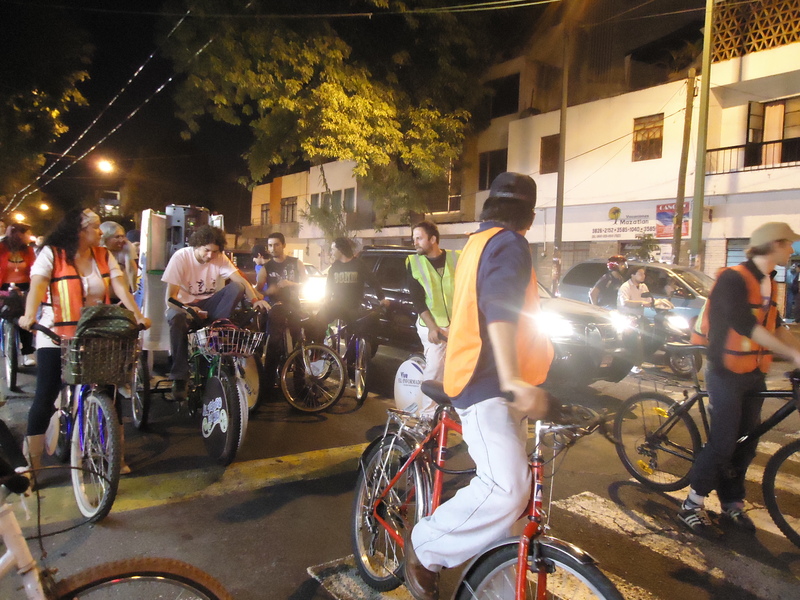 A win-win situation for the community, Guadalajara now has 230 “Ciclo Puertos” or ‘Cycle Ports’ at businesses throughout the city and the sales of the racks help fund the activists and their cycling ambitions. “Initially, our plans were without political support from the government, so we designed bike parking to sell to private businesses.” They designed a very odd looking, but efficiently designed rack that held each bike at a different height. This allowed more bicycles to be parked, by having the handlebars of each bike at a different level. Each of the Cilco Puertos could hold six bikes in a former car parking space. Bicipublica successfully marketed, sold, and installed these Cycle Ports to private businesses around the city. Each Ciclo Puerto has a sign printed with the logo of the business, a bike map, and cycling route finding for the area around each business. Because of the City Government’s failure to envision other modes of transit, it was up to individual businesses to install infrastructure to attract customers traveling by cycle. 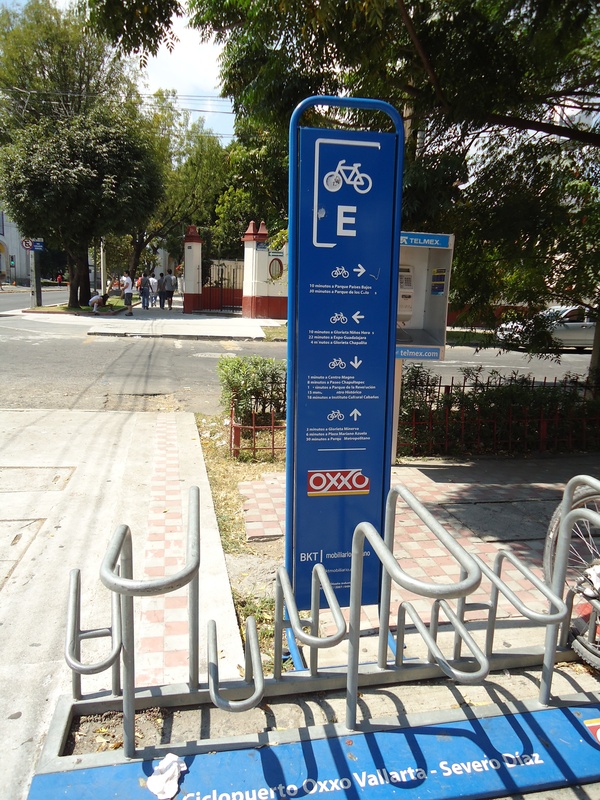 Bicipublica filled this void and has installed 230 of these cycle ports throughout Guadalajara. 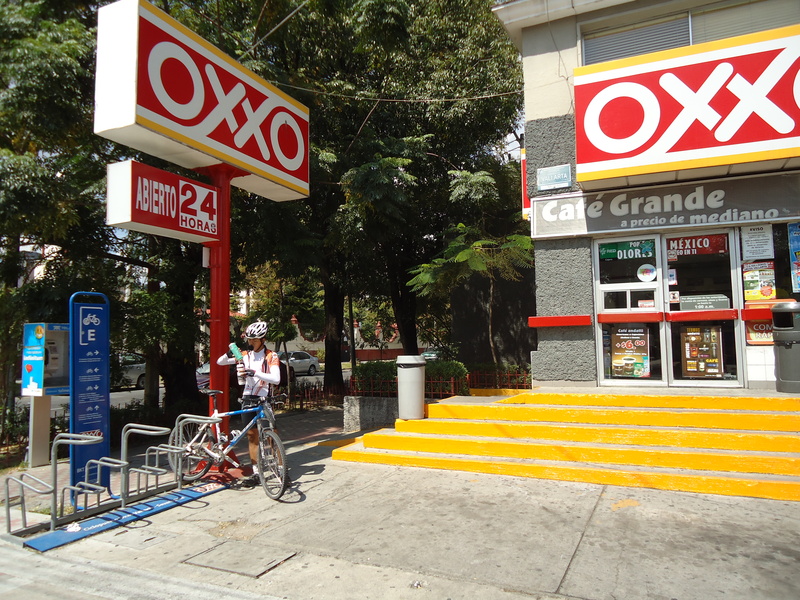 This Ciclo Puerto was purchased by Oxxo from Bicipublica and is located at one of their stores located on the weekly Via Recreativa route. ©Ryan H.
This cooperation with private business is a crucial aspect of the Bicipublica cycle plan. The organization located the racks at cafes, mini markets, restaurants, bars, & stores. Bicipublica also made an online Google map of all of the existing Ciclo Puertos and made this available on their website, www.bikla.net. When the local municipal government became aware of these cycle racks and of the online mapping, they were excited that Bicipublica was doing their job for them and providing public cycling infrastructure by working with local businesses. The Municipality of Guadalajara agreed to help provide some initial grant funding to allow Bicipublica’s cycle parking plan to grow. Bicipublica used the money earned from sales of the racks to start working on other ambitious plans that the city lacked the political will to pursue. 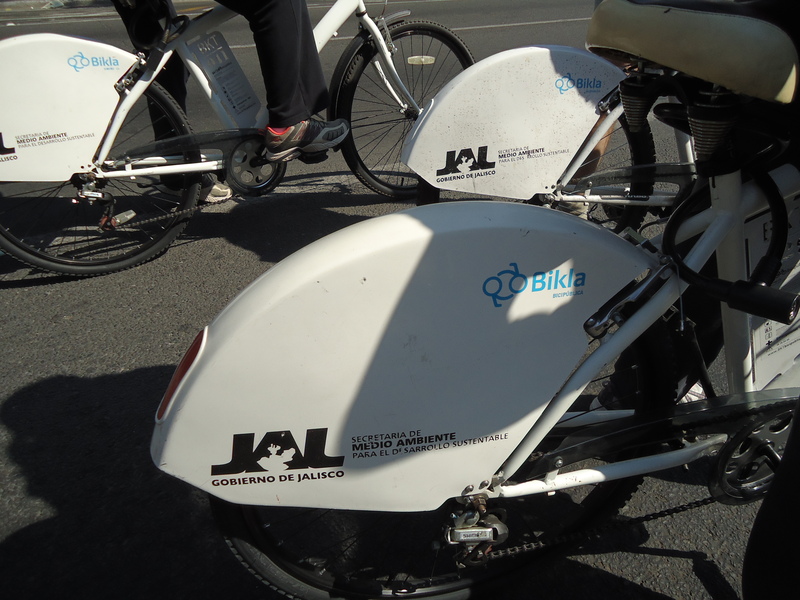 One of these projects funded by the sales of the Ciclo Puertos is Bicipublica’s ambitious Bikla bike sharing network. Unlike other cycle sharing networks in the world, Bikla is designed to be self sustainable with user fees and to have minimal start up costs. The cycling activists – social entrepreneurs of Guadalajra have many lessons to teach the world about developing affordable cycling infrastructure without political or governmental support. Bicicpublica looked to fill a void in their mobility network, turning lemons into lemonade by selling bike racks to private businesses and using the funds for their other ambitious mobility plans for Guadalajara. Stay tuned for our next story of how Bicipublica has developed a affordable and innovative bike sharing system. This cooperation with private business is a crucial aspect of the Bicipublica cycle plan. The organization located the racks at cafes, mini markets, restaurants, bars, & stores. Bicipublica also made an online Google map of all of the existing Ciclo Puertos and made this available on their website,www.bikla.net. We arrived to Mazatlan at eleven at night (5 hours later than we were promised and sold). It was dark and late. There was a lot of partying on the streets surrounding the bus terminal which made us frightened. After hearing so many horror stories, the last thing we wanted was to be on a foreign place with no plans, no friends and huge backpacks. We frantically walked around the blocks near the bus depot, shopping around and we found an affordable hotel room that supposedly air-conditioned and had WiFi. We paid one nights fee and followed the man to our humble abode. He gave as the key with a great big smile and a “Buenas Noches.” We were overjoyed saying: “WE MADE IT” with our traditional celebratory high-five, immediately followed by “is that a roach walking on our pillow?”Fortunately, it was not ONE roach, but actually TWO gigantic roaches taking a stroll on the white linen. Alas, it was by now much too late, we had already paid, and we had nowhere else to go. 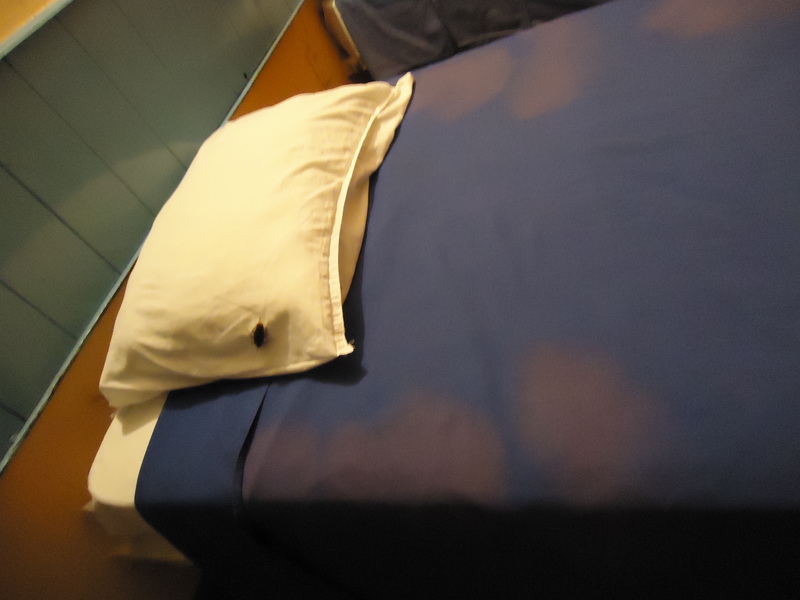 So we laid down a blue plastic tarp on the bed and opened our sleeping bags where we slept pillow-less on the tarp. investigated town. 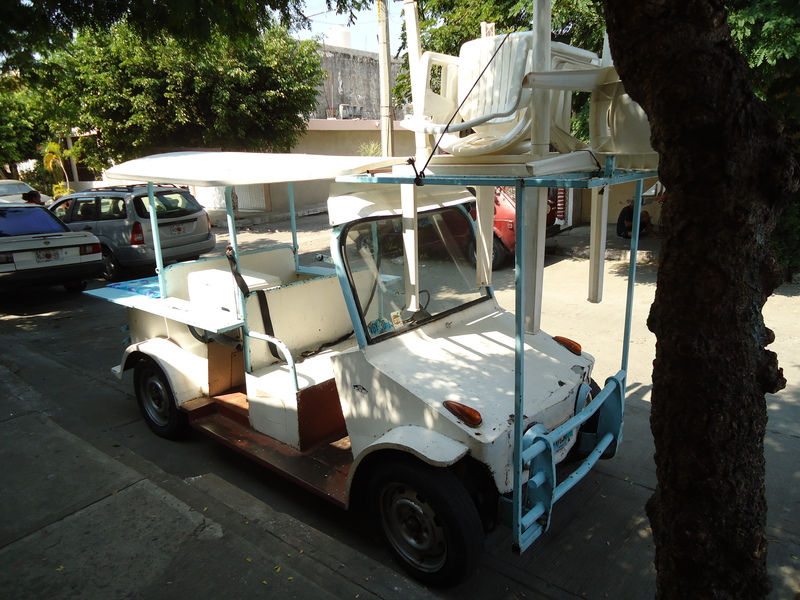 Mazatlan is a beautiful city full of life with a beautiful historic district and tons of these crazy Golf Cart taxis, called “Pulmonias” buzzing around. One of our biggest surprises with Mexico was all the suburban sprawl! Big box stores fringed the historic city. We explored town, walking the waterfront and taking in all the foreign sights. We had never seen preschool walls guarded by broken glass embedded in concrete along the top. We wandered the colonial streets and found a Paleteria! Back in Portland, we run an Ice Cream Tricycle business vending fruit popsicles made from Paleteria Paisanito in Woodburn, Oregon. The owner of Paisanito makes the most delicious treats and even custom flavors for us. We were so excited to find a Paleteria here in Mazatlan and even more excited that they were trying new popsicle making techniques, like not using corn syrup and trying natural coloring. The owner was a bit bewildered to meet Tricycle Paleta Vendors from Gringolandia, but she happily toured us around her cute shop. We left with big smiles and devoured her fruit treats in the Mexican sun. The old town is gorgeous and we explored it’s narrow alleys. As the day wore on, we began to think about the night. Not wanting to sleep with our cockroach friends again, we logged online at a web cafe on the main plaza and checked into Couchsurfing.com. We had used CouchSurfing once on our trip South in the States and had a great night with an old professor on the Oregon Coast. We had received some offers in Mazatlan, but did not want to call our hosts that late at night. It is always a bit nerve wracking to make the CS call, our plans always are upended, usually in a great way. We called our potential host. It was late in the afternoon and Miguel was just waking up, he scolded us for not calling him the night before. Miguel knew the cafe that we were at and he sent his favorite taxi driver to pick us up! His address was in Zona Dorada or the Gold Zone. The taxi showed up promptly and wove in and out of traffic to get us from the historic center to Miguel’s abode. The streets were hectic and busy as we drove through the neighborhoods. Street performers dressed as ancient Aztec warriors danced in the intersections for spare change. The Gold Zone lived up to its name and the businesses turned dramatically glossier and more corporate as we approached the entrance to Miguel’s gated community. Lale and i spoke to each other nervously in English, trying to figure out whether we had gotten ourselves into trouble here. Were we heading to the palace of a Narco? Miguel lived in this palatial housing complex surrounding a golf course and many swimming pools. We were not sure what to expect. He came out of his beautiful condo and welcomed with perfectly American accented English. Miguel toured us through his place and showed us our room with a private bathroom, Egyptian cotton sheets, and our own personal towels! We settled into conversation and slowly discovered that Miguel was just a dorky fellow who worked for a Canadian mining company. The luxurious setting of his housing community was mostly a haven for American Gringo retirees and for rich Mexicans. 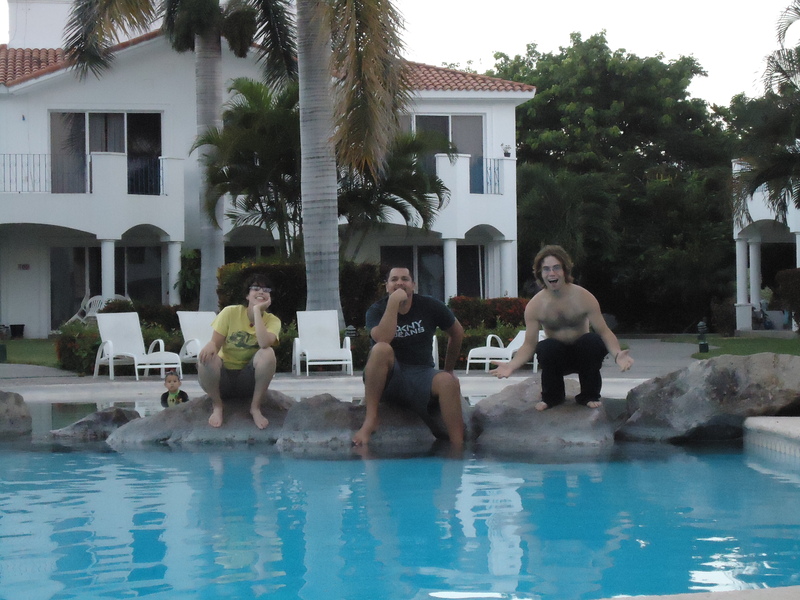 For the next two days, we enjoyed this royal CouchSurfing lifestyle. Miguel insisted on going out on the town and we had dinner in the middle of the Historic Center. Afterwards, he slick talked us into the municipal theater and we watched an incredible choir and concert. It was quite a remarkable difference from our Cockroach motel!